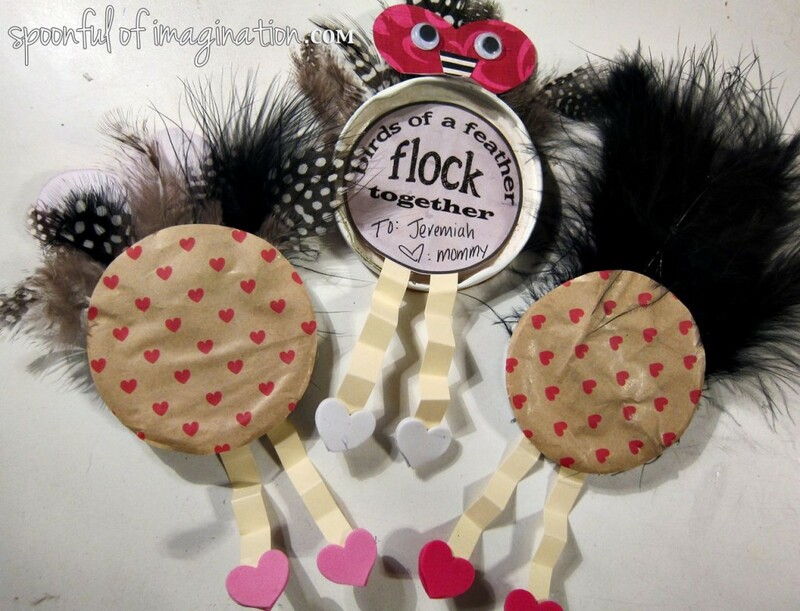 I am so excited to share with you these sweet Valentines I made for my kids. 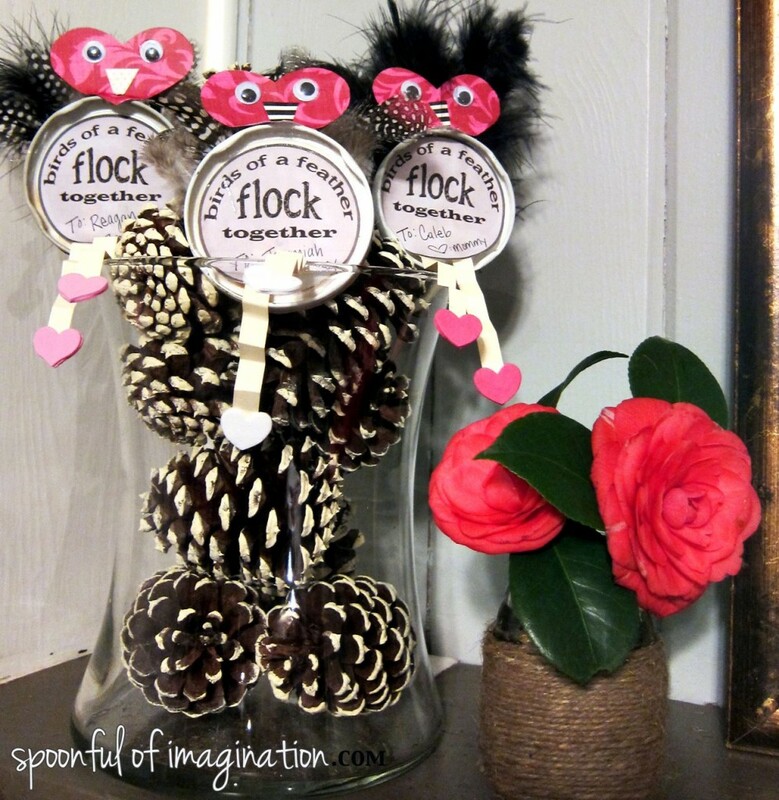 The other day I was watching them all play sweetly together (which as much as they love each other does not happen all the time), and it made me think of that popular phrase “birds of a feather flock together.” They are my sweet little flock that always wants to be together. They love each other and it warms my heart. 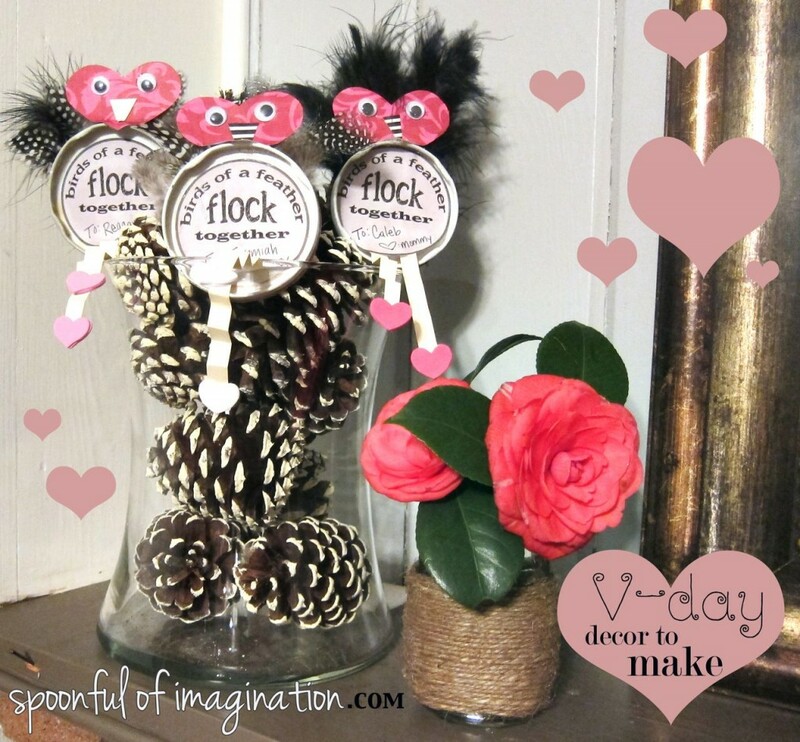 I am going to show you step by step how to make these sweet little Valentines that you can also use as Valentines decor around your house. 1) The first step is to spray paint the backs of your old jar lids. 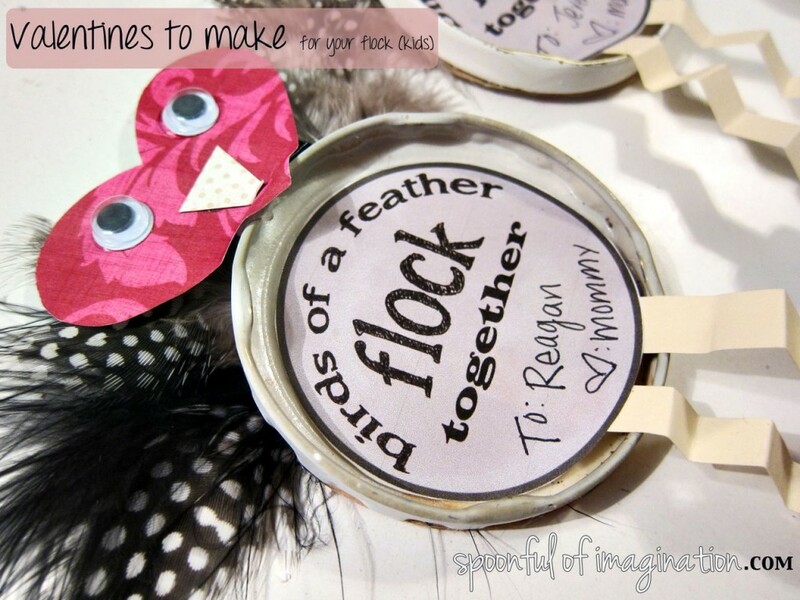 2) Use the jar lids as a stencil to draw the right size circle for the back of your bird. 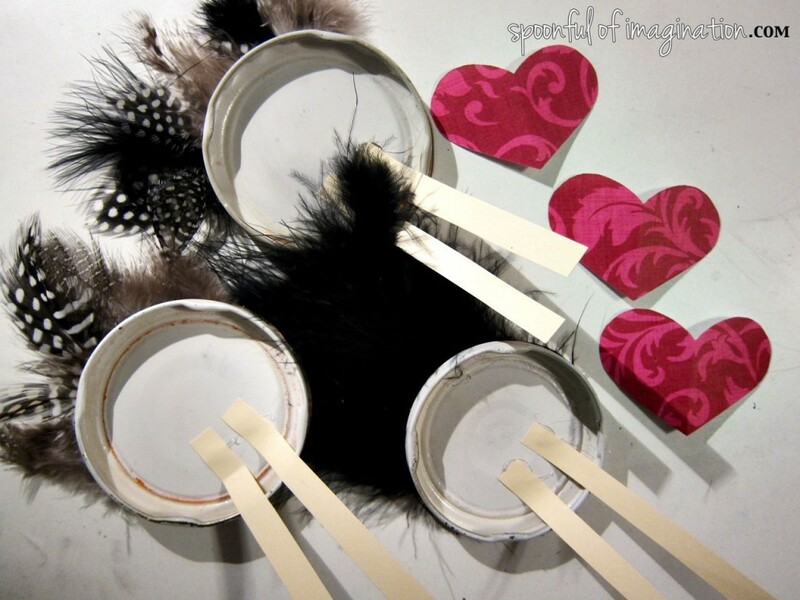 3) Cut out your circles and get your hot glue gun and feathers ready to glue. 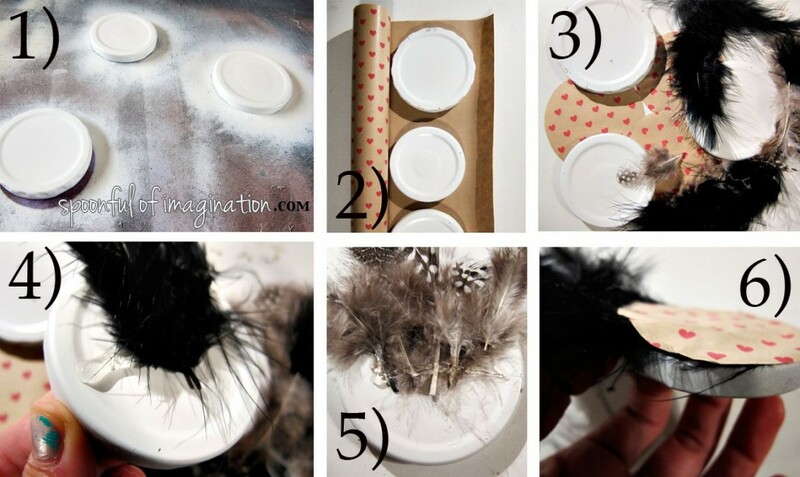 4) Put a strip of hot glue straight across about the middle (depending on size of feathers) of your lid. 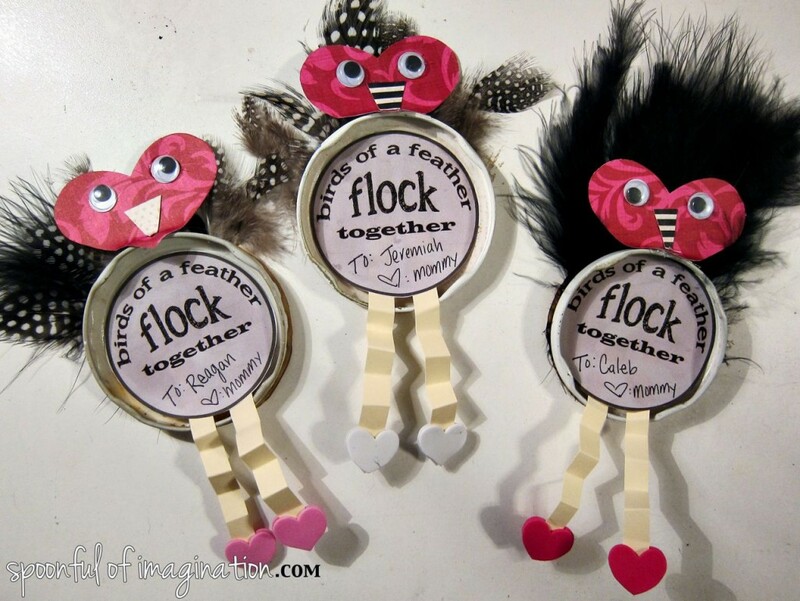 Press feathers into the hot glue. I used about 5 feathers per bird. 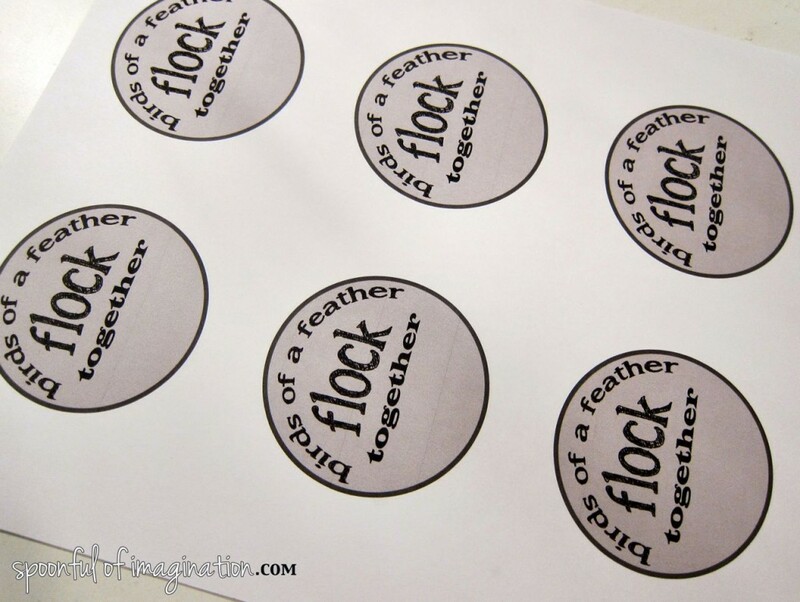 5) Add another strip of glue on top of the end of the feathers to glue your precut circle bird back onto the lid. This will cover up the ugly ends of the feathers and make your bird look more finished. 6) Press your circle onto the hot glue. Add more glue to seal down the ends as needed. Next, I cut out small strips of creme paper for legs and hot glued them inside the lids. 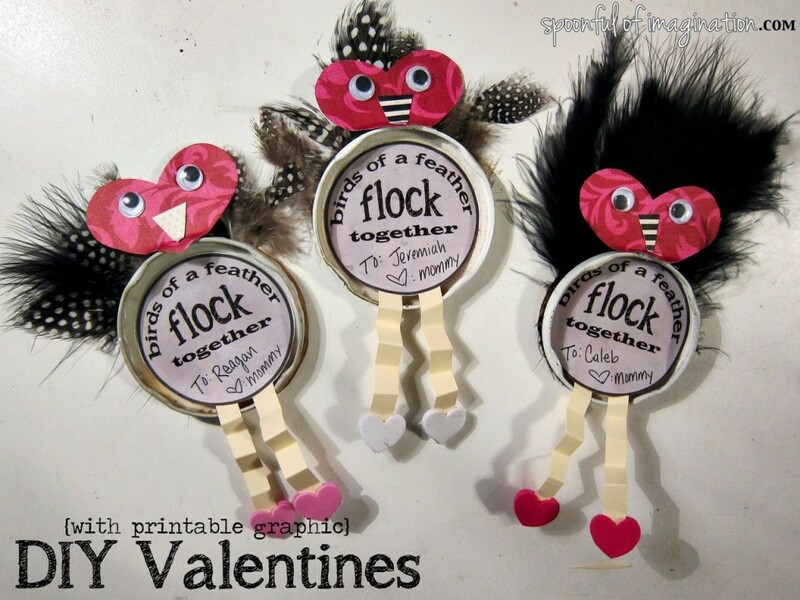 Look at the picture above, I also used red scrapbook paper to cut small hearts out to use for the birds’ heads. I went back and folded my legs accordion style to add fun dimension to my birds. I then used small foam heart stickers to stick on the ends of my legs to be the feet. I used four stickers per a bird, sticking them to the front and back of the legs. You could easily cut out hearts to do this step. 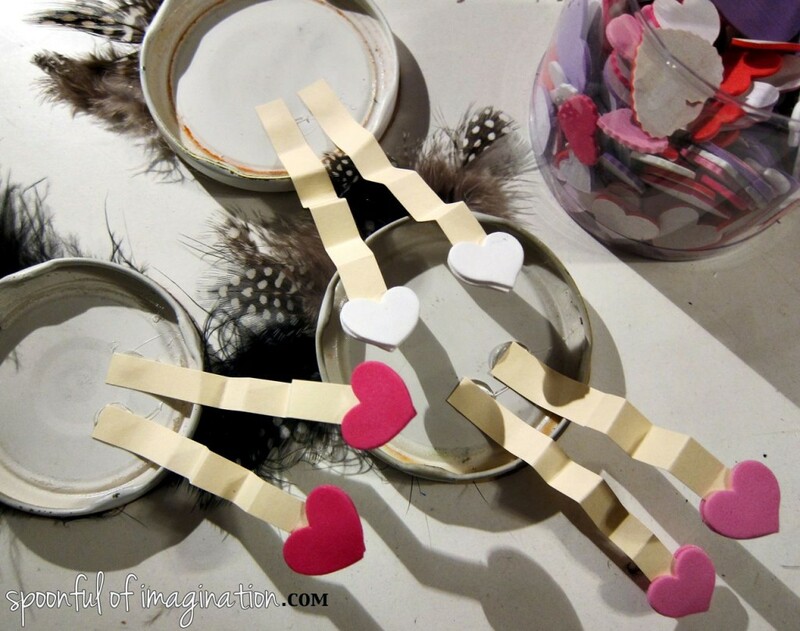 I had snatched up a big container of these hearts in the dollar section on Target and have been looking for a craft to use them on. Next, I added some googly eyes and a small triangle I cut out of scrap paper to decorate the birds’ heads. Simply use some more glue to stick the features on. You are almost done! Print out my graphic (listed at the bottom of this post) that I have made and am sharing with you for free! I created 2.5″ circles and have put six on a sheet for you, so they are easy to cut around. Once you print them out, cut the circles out. Glue the circles into the center of your bird’s belly (inside of the lid). I went back and wrote my kids’ names on the bottom of their Valentine. I left that room so you could put anything you want in the open space. One quick tip: Watch how you glue your papers on, or you might end up with some sideways hearts like me. 🙂 See above picture. My kids love their Valentines (that I already gave to them!?). Now, they want to make their own, so we are going to! I think we will substitute the hot glue for Elmer’s glue to make it more kid safe. To download the birds of a feather graphic, simply click on the link below and follow your computer’s instructions to save the pdf file. Once saved, open it, print, and enjoy! 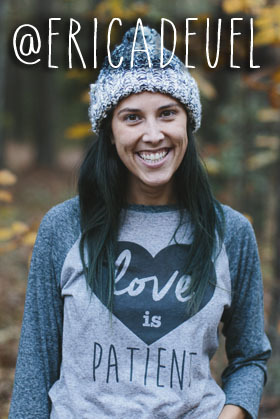 Are you thinking of Valentines Day yet? Will you make any Valentines? Now let’s get this All About the Kids Party going! Please link up YOUR new post! These are sooo cute!! Very creative, Erica!! super cute Erica! 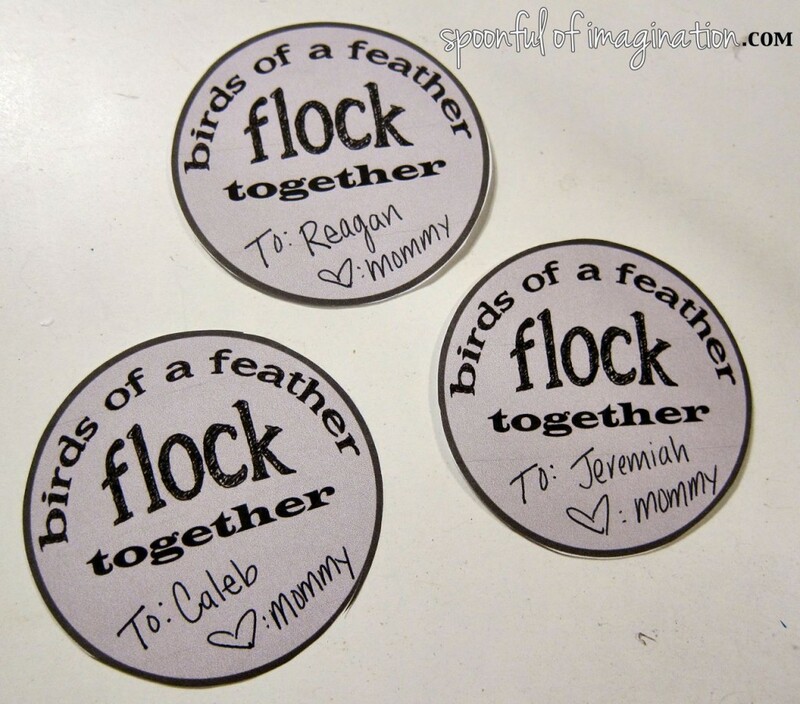 I could just picture my boys dive-bombing around the yard with those beautiful birds! hahahah YES, Heather! My boys loved theirs but I told them they cant play with them yet 🙂 I want to enjoy them for at least a week before they get ruined!